A gift for us all. What does it actually mean to live ones life? Is it to squeeze every last drop out of ones day filling it with memorable experiences? Not for me, although I’ve been blessed with many a memorable moment in my life. Let me think….to me, at the moment, living life is to appreciate/be with the life of THIS. Just this. That can be as simple as feeling warm water running over my hands, listening to a bee gathering food or catching a sight of the wide sweep of this West Allen Valley in Northumberland, where I’m currently living. Here a short video showing the waterfall in all its glory. 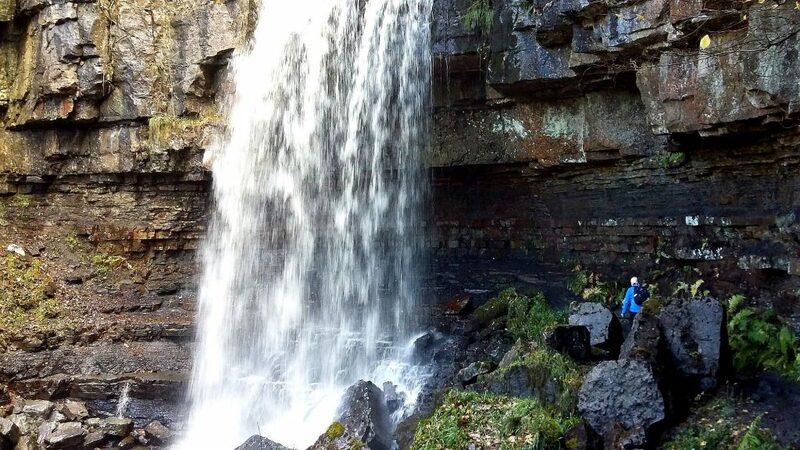 Twas a great few hours in Autumn sunshine walking up to this fantastic waterfall. Awesome waterfall video! Loved you waving! Jessica! Let’s go there when you are next over here. Please. Jessica, just say the word and we will have fun visiting. However I think you are very involved with your life where you are.